Home Decor, Jams, Jewellery, Sweets and much more, presented in a Friendly Victorian setting. would receive a photo of the other child with their new bedkit. indeed one of the few 100% Charities,” said Chris. alone, they were able to deliver 5,000 kits there. groups, or service clubs to talk about SCAW. The second annual Philippines fundraising dinner was held on April 2 at the Heartland Community Church in Clinton. This dinner supports two charities, Sleeping Children Around the World (SCAW) andHarvest of Love. 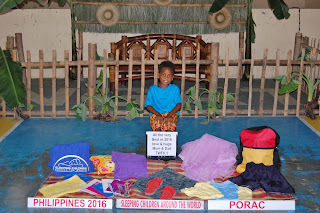 By donating to SCAW, people can purchase bed kits with the knowledge that 100 percent of their donation will be given to children living in poverty. Thekits include such items as a sleeping mat, mosquito net, clothing, personal hygiene items and school supplies. Husband and wife Chris andGailHills volunteer with SCAW. Volunteers can go overseas to assist with giving out the bed kits once per year. This is the last year Chris will be going to the Philippines as SCAWrequires team leaders to change which country they visit after four years. 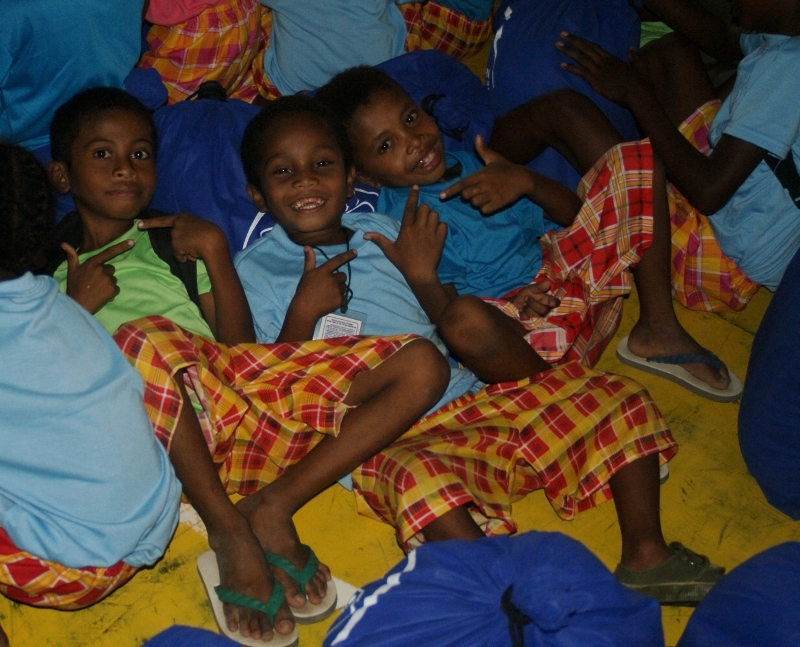 SCAWfacilitates 12-13 distributions per year, giving out between 5,000-6,000 bed kits per visit to each country. Chris explains that many of the villages that he has visited consist of homes that are approximately 20 feet by 20 feet with a dirt floor and no amenities of any kind. Many of the villages are on river flats that flood every year. The families are living in extreme poverty. The Harvest of Love was founded by Charie Hendrick. This is a family- run charity to feed less fortunate people near her home in the Philippines. 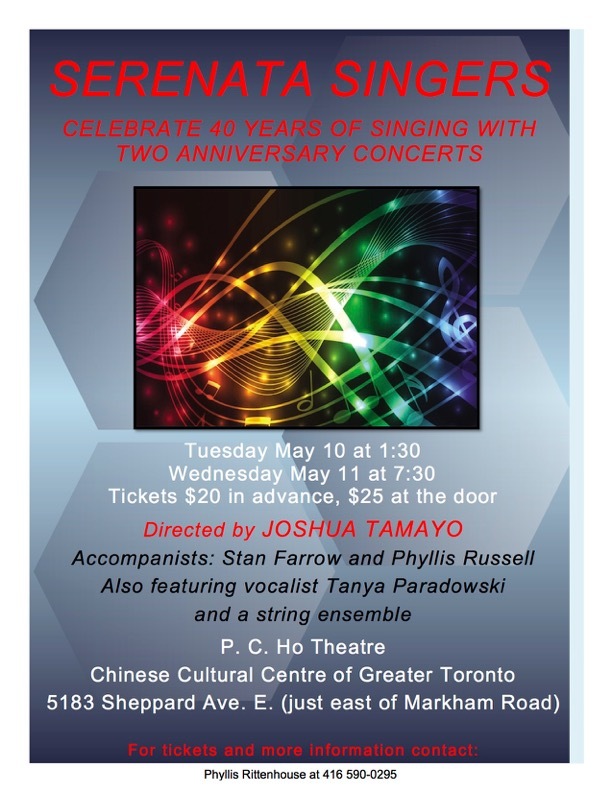 The Fundraising Dinner began as a different project in 2014, when Hurricane Hayan struck the Philippines. 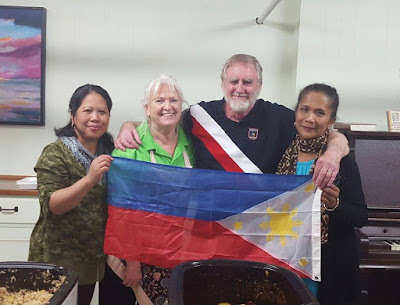 The Canadian Filipino community realized that they needed help and held the first Philippines Fundraising Dinner. The first dinner was such a success that it was decided to hold it again, but this time making it a combined fundraiser for the two charities with half of the proceeds going to each. 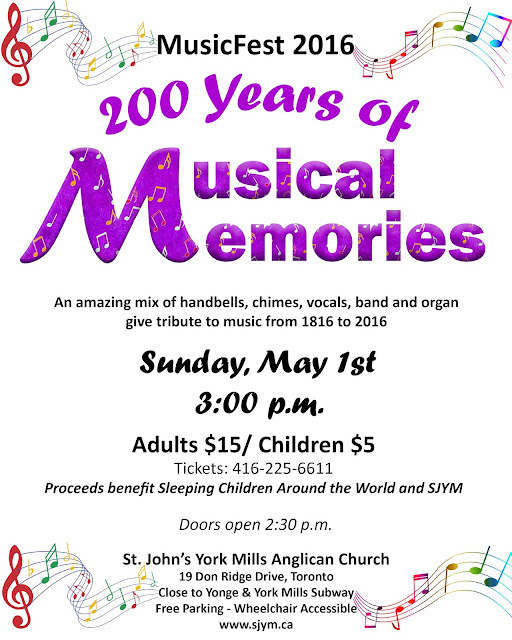 As posted in the Stratford Beacon Herald, March 24, 2016. Click graphic for larger size. Her effort to help others begins in Stratford and spans the globe. Little wonder, then, that city resident Sue Orr has received the prestigious Stratford YMCA Peace Medal for 2015. "She is absolutely a peacemaker," said Y chief executive officer Mimi Price in announcing the honour. "Sue is one of those people who we know is there doing a lot, but when you take a moment and add it all up, you go, yes, she's definitely bringing peace to our community, and Canadian peace to developing countries. "She shows people in these developing countries that we're listening, we care about you." Price said the Peace Medal honours those "who make a difference, who make a contribution to make somebody else's life better, or a community better." Orr was a natural choice, she added. For nearly a decade, she's been active in global outreach with Sleeping Children Around the World (SCAW), a Canadian-based charity started in 1971 by Murray and Margaret Dryden. Since the Drydens began the charity with $3,000 of their own savings, SCAW has provided bedkits to over 1.4 million children in 34 developing nations around the world. The kits generally consist of a mat, mattress or bedding, school supplies and a school bag, clothing and footwear, and a mosquito net. Orr began volunteering with SCAW back in 2007. She said she was immediately impressed by the ideals of the group, with all funds collected going directly to improving the lives of youngsters around the world. Volunteers like Orr pay for their own travel and accommodation. She has served in Kenya, Bangladesh, India and Togo, and recently was named a team leader. She plans to continue to volunteer annually in India for the next three years. In her years with SCAW, Orr estimated she has helped distribute 29,000 bedkits. "It's brought so much to their world," Orr said of SCAW's efforts to help youth. "This will change their lives." In addition, she also serves as co-chair of Stratford and Area World Aid, and is involved in a water project to aid residents of Addis, Ethiopia. Along with those global outreach efforts, Orr has also been active in helping those in need in her own community. She serves on the board of Stratford House of Blessing and is a regular volunteer at the Erie Street facility. Like SCAW, the House of Blessing is a charitable organization that she holds in high regard. It's a valuable local resource that provides cooking lessons, clothing, household items and food to deserving local individuals and families. "I appreciate what they do," she said. "They have been able to bless so many people by passing along donations of clothing and household items. They also make sure that we recycle as many items as possible in a responsible manner. "I truly see the value in this mission and how it fits the needs in our community." She also finds time to help with a breakfast program at Romeo Public School, and serves as secretary for the Stratford and District Council of Churches. 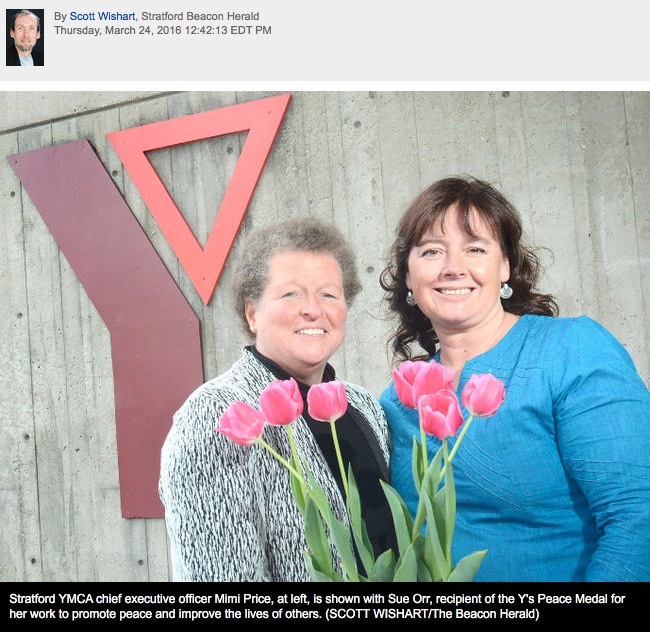 In years past, she's volunteered with the Stratford Skating Club, To Stratford with Love, Miles for Memories and Community Living Stratford and Area's annual Swing into Spring. Asked what motivates her, Orr simply said, "It's who I want to be. "I see value in making peoples' lives better, whether it's in developing countries or here in Stratford. "I have been blessed, so I need to bless others." Orr said her volunteer work would not be possible without the support of her family, including husband Jeff and the couple's two children Greg and Nicole, their extended family, and friends. And while not one for the spotlight, she said she hoped her Peace Medal will help spread awareness of the various charities she supports. "I don't like to draw attention to myself," she said. "I like to do things under the radar. "But if I can bring attention to some of the organizations I volunteer with, I'm more than happy to do that." Looking forward, it sounds as if Orr plans to keep as busy a schedule as ever, balancing her global volunteer work with her efforts closer to home. "I've got to keep helping people. At the end of your life, if you look back at the things that matter the most, it doesn't matter how much money you have or what kind of car you drive. "It's what you did for somebody else." ONCE AGAIN, PEGGY MORRISON AND CINDY HOBMAN, WITH THE HELP OF SCAW VOLUNTEERS, WILL BE HOLDING THE 2ND ANNUAL GARAGE SALE WITH ALL PROCEEDS GOING TO BEDKITS. LAST YEAR, FUNDS WERE RAISED TO PROVIDE 136 CHILDREN IN UGANDA WITH BEDKITS. OUR GOAL THIS YEAR IS TO SURPASS THIS NUMBER. SPREAD THE WORD ABOUT THE GARAGE SALE AND ASK FRIENDS, FAMILY AND NEIGHBOURS TO DONATE? A BIN HAS BEEN PLACED IN THE SCAW OFFICE FOR DONATIONS. WE WILL EMPTY THE BIN REGULARLY AND STORE THE ITEMS UNTIL THE DAY OF THE GARAGE SALE. ITEMS CAN ALSO BE DROPPED OFF AT THE CHURCH ON FRIDAY, MAY 27TH BETWEEN 5:00 AND 8:00 P.M.
PLEASE…NO BOOKS (EXCEPT CHILDREN’S), NO LARGE ITEMS OF FURNITURE, NO CLOTHING. IF YOU HAVE ANY QUESTIONS OR ARE ABLE TO ASSIST ON MAY 27TH AND/OR 28TH, PLEASE CONTACT EITHER CINDY (cindyhobman@gmail.com) OR PEGGY (peggy.morrison@cogeco.ca). The Serenata Singers support three charities, one of which is SCAW.